–By the time they have been retired for 2 years, 78% of former NFL players have gone bankrupt or are under financial stress. –Within 5 years of retirement an estimated 60% of former NBA players are broke. Those were alarming statistics. It was suggested by one of the commentators that those statistics might be inflated. Even so, if you cut those percentages in half it would still be alarming. 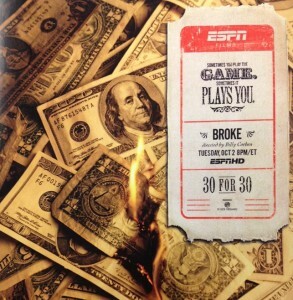 The documentary was presented into segments like chapters from a book that covered getting their first professional check, spending it on bling bling, being a target for women looking to get pregnant by a pro athlete, to being a victim to bad agents, con-men posing as financial advisers, suspect investment opportunities, and even being milked like an ATM from family and friends to frank advice for other athletes. Many athletes from the NFL, NBA, and MLB spoke on the documentary honestly about their financial troubles and looked back realizing how much money they spend and lost during their short careers. I appreciated their frankness and would recommend all athletes watch this documentary to learn what not to do. Moreover, I saw something that stood out for me in watching Broke. In the segment about bad agents, con-men, and family and friends, many of these athletes were taken for a huge portion of their wealth. For example, Andre Rison, former NFL wide receiver, told a story that he gave thirty-thousand to a friend who wanted to open a frozen drink place. The friend said it would be in a prime location in the city of Atlanta. Rison said he only visited the business twice and lost his money shortly after. Bernie Kosar, former NFL quarterback, said it became too exhausting to hear about every story that he could invest into in order to make millions or save the world. William “Tank” Black, a prominent agent to many NFL and NBA athletes were convicted in July 2000 for embezzling fourteen million dollars from his clients for personal use. Those popular verses of scripture highlighted from the above examples what the love of money can do to those around pro athletes. In context, Paul was writing to the church of Ephesus through Timothy about the false teachers that had infiltrated the congregation and corrupted the church. Also, he exposed those false teachers for their love of money and once that took root would eventually lead to destruction. Well, those bad agents, con-men, even family and friends are false teachers and their target is the pro athlete. I know many of us don’t have a lot sympathy for millionaire athletes and their financial troubles. Especially when many folks in this economy have their own issues. However, I believe there is a bigger issue at play and watching Broke has illuminated it for me. When athletes salaries were first publicized (which I have never liked) it started a dehumanizing effect on those athletes. As a result, fans and others can only see pro athletes in terms of how much money they make and not who they are as a human being. I’ve heard on sports talk radio all the time….he makes 15 million a year and should play hurt. I would if I was making that kind of money. This player is making 27 million dollars a year and he can’t get a hit. What’s wrong with him. And there are many similiar comments. But, we have lost the fact that athletes are people. While they have entertained us, awed us with their athletic gifts, and created civic pride when they are pursuing a championship….there’s a dark side and the documentary effectively pointed this out. Broke has shown a human side to professional sports and created sympathy for those athletes who are caught up in this high-stakes game of money, fame, and its excesses.